On the award-winning 4 day Maria Island Walk, you will walk along the pristine untouched beaches, wander through magnificent gum forests and step back in time, walking where convicts and explorers have walked before you. 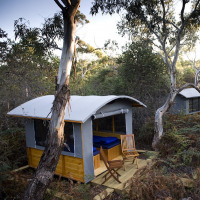 You will have the opportunity to get quite close to a wide range of wildlife and birds, including rare and endangered species like the Swift Parrot, Cape Barron Goose and Tasmanian Devil. Maria Island is considered one of the best places in Australia to observe wombats in a wild setting. Maria Island Walk has been selected as one of the Great Walks of Australia. To be selected, everything has to be outstanding; the scenic beauty of the walk, the comfort of the accommodation, the quality of the meals and the experience and personality of the guides. 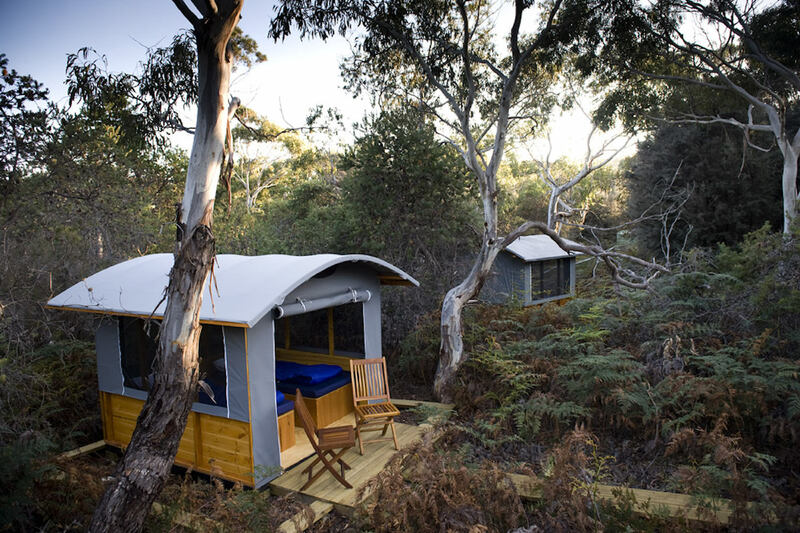 The first two nights are spent at exclusive, secluded camps, tucked away in the beautiful surrounding forest, moments from the beach. Fall asleep in a comfortable bed in your private bush cabin to the sound of waves gently lapping nearby and wake to the sound of birds in the forest. There are warm outdoor showers and composting toilets. 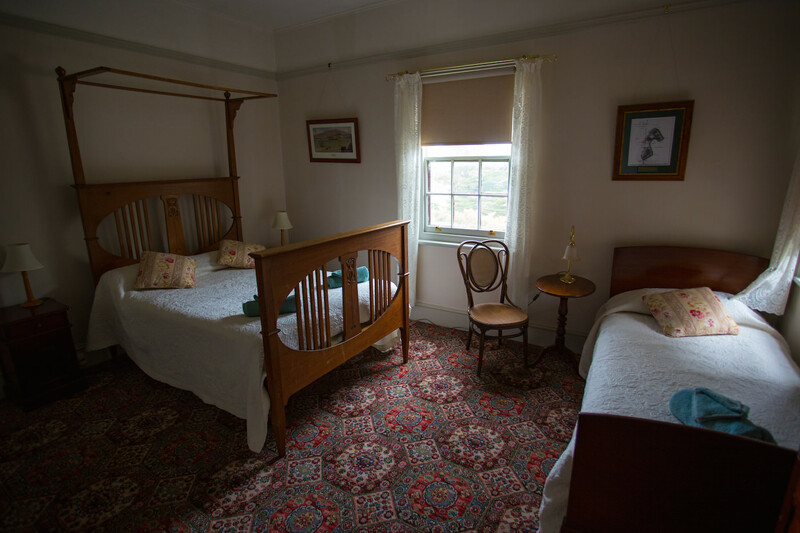 The last night is spent at the beautifully restored, heritage listed Bernacchi House at Darlington, dating back to 1880. You will be collected from your central Hobart accommodation this morning between 7.30am and 7.45am and taken to the Maria Island office where you will meet your fellow walkers and guides. We then drive to the historic coastal town of Triabunna (approx. 90 minutes). Here we board our boat which will take us through the sparkling waters of Mercury Passage to the isthmus of Maria Island, where we set foot on a pristine, untouched beach. Enjoy lunch overlooking the azure waters of Shoal Bay before we take a short walk to Casuarina Beach camp. This afternoon, you may choose to relax around the camp or take a walk to the stunning Haunted Bay or Robey's Farm. After your guides serve a gourmet dinner of fine Tasmanian produce, end the day with a sunset stroll along the beach with a glass of wine. Walking for the day is 3km or 12km if taking one of the afternoon walks. After a relaxed breakfast, there is plenty of time to enjoy the surroundings before we walk from Riedle Bay across the isthmus and stroll along five fabulous beaches. The convict cells at Point Lesueur and the ochre pit at Bloodstone Point prove fascinating viewing along the way. By late afternoon, we arrive at White Gums Camp for a refreshing swim. 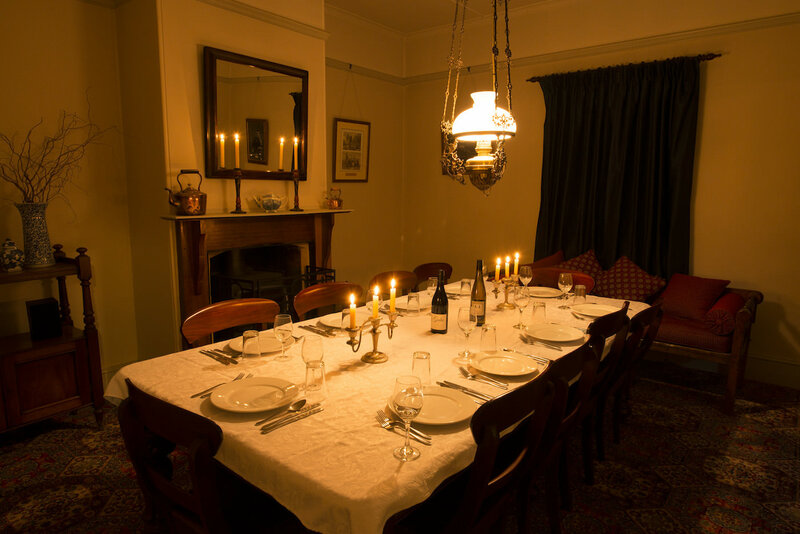 Relax with your fellow walkers with a drink on the deck before enjoying a candlelit dinner of the finest Tasmanian food and wine. Today after breakfast we head inland through stunning forests and the world's largest stand of giant Tasmanian Blue Gums. The gentle track passes Hopgrounds Beach and the Painted Cliffs before arriving at Bernacchi House in World Heritage listed Darlington. For the more adventurous, the 711m summit of Mt Maria calls, delivering breathtaking 360 degree views. Alternatively, a hike up Bishop and Clerk is another rewarding option. 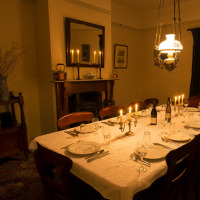 This evening, enjoy hot showers and a beautiful dinner in a traditional classic dining room. Walking for the day is 6km or 17km if taking one of the peak walks. After breakfast served in the house, there is time to explore the convict settlement and industrial ruins of Darlington. A farewell lunch will be served overlooking Darlington before we board the boat for Triabunna and the return trip to Hobart. Daily departures from 1 October through to 1 May, with a minimum group of 4. All accommodation is twin share. Single travellers may be required to share a room with someone of the same gender. 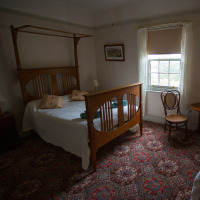 To guarantee a single room for the duration of the walk, a supplementary price of 75% of the tour price will apply. This walk caters for clients who can walk 10 – 15km per day carrying light backpacks of 5- 8kg. A moderate level of fitness is required. Maria enjoys a mild maritime climate, making it the perfect destination for a walking holiday. With average temperatures in the low twenties and sea temperatures around the same it is the perfect weather for exploring and swimming the beautiful white sandy beaches of Maria Island. Wildlife is abundant all year round on Maria, being an island it is near impossible not to encounter a plethora of native animals. Most of the islands animals breed in the spring so the new young can take advantage of the spring rains and new growth, so there is benefit in walking in the cooler months (October/November).